Typical is not a word we’d use to describe a day in the life of Fred – no two days are the same. From morning until night – sometimes until very late at night – Fred works tirelessly with the Burmese community living on the dump near Mae Sot. We are so privileged to be able to spend time getting to know more about what Fred & Eyes to Burma do here – and it is a privilege. This is not a circus or a sideshow – this is real life – and the people living here are just like anyone else – trying to make ends meet. We arrived here on Tuesday & pretty much hit the ground running. Fred showed us around again & brought us up to speed with where things were at. So much has happened since our last visit – and all for the better. Change is happening & although at times change is met with resistance, ultimately the community embrace these changes realising that they are positive & only serve to empower them moving forward. Some of the kids are now attending school & 16 of these kids are also learning English. You can imagine our surprise & excitement when we discovered that we too could have a conversation with these kids, ask questions & find out more about them – something that we weren’t able to do 12 months ago! The programmes that have been implemented since our last visit are long term but you can already see the difference – so it’s great to know that the donations coming in from around the world are making a massive impact. Self sustainability is the ultimate goal – & we’re well on track to achieve this. The first couple of days have been busy, but in a good way. We’ve been a part of Fred’s day – every step of the way. As we write this, we’re at the dump waiting for a replacement clutch for his truck – as mentioned earlier – there’s no such thing as a typical day! Fred has picked up a ride back to Mae Sot & we’re cleaning up the medicine cabinet so that we know what Fred needs & can purchase it before we leave. To date, we’ve purchased 60 pairs of rubber boots, batteries, headlamps, food, knives, washing powder & other essential items – & we’ve barely scratched the surface of the donated money we’ve brought over! Over the next few days we will determine with Fred what else is needed & purchase it before we go. The kids here are absolutely fantastic – smiling and intrigued by the new people. Some remember us from last year – so it was good to know we’ve made an impression. So much more to share, but have work to do now so will sign off. Be in touch again soon! 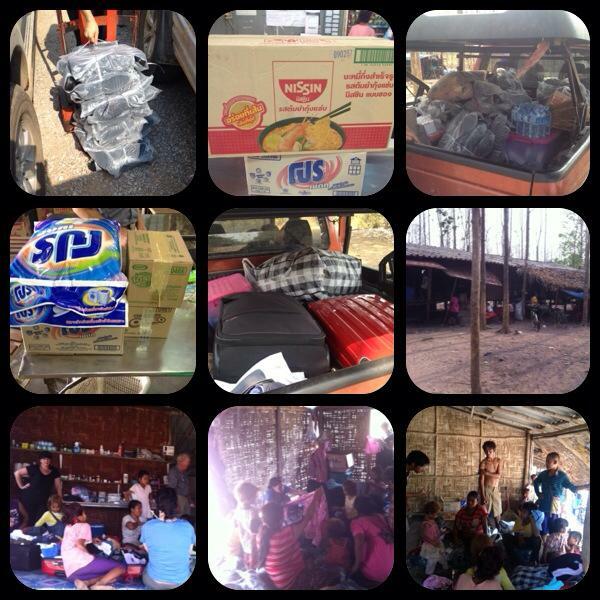 This entry was posted in Mae Sot Volunteers and tagged Aussie Friends, Burma, mae sot. Bookmark the permalink.